It was a crisp fall afternoon when I attended a lecture by Ananda Ghosh on technology transfer at Albert Einstein College of Medicine. I thoroughly enjoyed the talk and like always, I decided to connect with the speaker on LinkedIn. While browsing Ananda’s LinkedIn profile, I saw he was the co-founder of a website, “Club SciWri.” I explored the website and discovered that it is a treasure trove of blogs for STEM PhD career guidance and science communication for international postdoctoral scientists. Club SciWri (www.sciwri.club) is an online magazine of the Career Support Group (CSG) for STEM PhDs created by Ghosh (New York University) and Abhinav Dey (Emory University). CSG is a registered nonprofit in the U.S. that aims to connect highly talented STEM researchers on one platform. CSG runs widely via its Facebook platform with nearly 8,000 members who are doctoral and postdoctoral researchers from 100+ top rated universities around the world, research scientists from top global pharmaceutical companies, or those who are pursuing careers in technology commercialization, intellectual property, science policy, consultancy and project management, or are establishing their own startups in India, the U.S., and Europe. At the core of this science communication venture is strengthening the connection between scientists and society. As science advances to defy the limits of human imagination, it becomes more crucial that scientists enable society to understand the benefits of their work. The unique thing about this club is that the writers are practicing scientists from a myriad of careers. These sculptors of science can convey the true sense of their creation and the nuances of their work. An important aim of Club SciWri is to help STEM professionals achieve visibility for their scientific endeavors through blogging in social media. With this objective in mind, Club SciWri is systematically designed to help STEM professionals reach their career goals by providing them an online platform not otherwise available. The freedom to design my own series of blogs and the opportunity to inculcate leadership skills en route made me decide to become a part of Club SciWri, and I started my healthcare business blog series, “MedNess.” I introduced “MedNess” to add a business value to science. This biweekly blog lays out impactful news in the healthcare industry and research world that affects researchers and healthcare professionals interested in investments and equity reports. The website also has other sections, including the life of a PhD student in a lab, running a healthcare business, careers in intellectual property and science policy, career stories in science communication, and career advice in science graphics. Club SciWri boasts an exceptional team of graphic designers and illustrators! Every blog published on Club SciWri is illustrated and polished in-house by the illustration team and editing team, respectively. This image is dedicated to all those people who are working hard to find solutions in order to fight cancer. 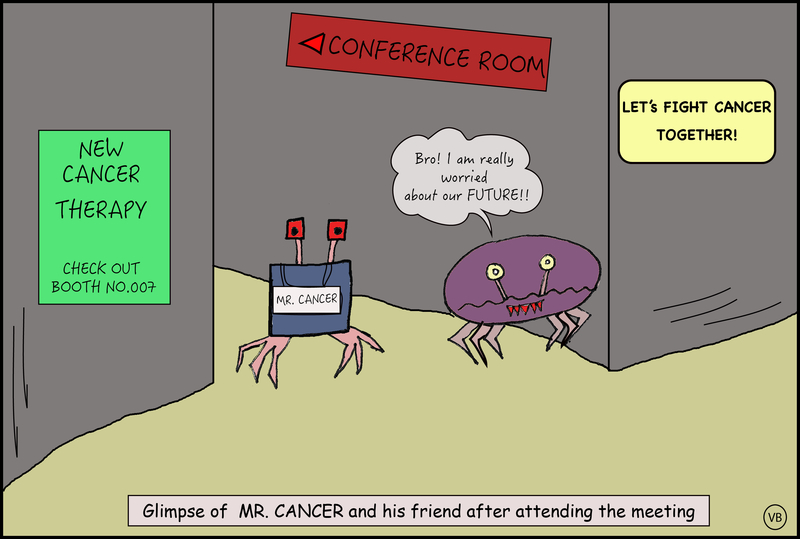 It depicts that in the future, advancements in science and technology will lead to cures for cancer and other diseases. This image was created by in-house cartoonist, Vinita Bharat and was originally posted here. Other top-notch blogs on the site include “The Patent Chronicle,” which discusses the latest in intellectual property and prompts healthy discussions and debates. “Science Policy” encourages community literacy about various issues at the interface of science and policy. The ClubSciWri newsletter provides a weekly overview of information that one might have missed during a busy week. It also provides a heads-up about news/events in the coming weeks. The blog “Reporting from the Lab” is like a journal club that features recently published research from a range of high-impact journals. It also features regular interviews with those who have transitioned to various STEM careers or entrepreneurship. All the blogs are globally oriented and cover major events taking place worldwide. The core of all the blogs is to create awareness on issues that are relevant to the world outside the bench. They offer examples of what is out there for STEM PhDs and show that it can be intellectually stimulating. Our team of writers and editors recently initiated a collaboration with Joe’s Big Idea (created by NPR’s Joe Palca) for the dissemination of our content to an even wider audience. We also hosted an interview with Robert Krulwich (co-host of RadioLab, NPR) on his perspectives in science communication. This is a line portrait of Robert Krulwich, the co-host of science podcast, Radiolab. The sketch is surrounded by elements from some of his podcast stories, including snails, weather, ivy, hot air balloons, radioactivity, bees, New York, and art. This image was created by our illustrator Ipsa Jain, who also interviewed Krulwich for this blog in which Krulwich and Jad Abamrud at Radiolab share stories of curiosity and science that are ‘beautiful’. In this blog, Krulwich shared that the secret lies in explaining the science by sharing your own surprises, mistakes, and learning during research. Shared joyously, science is hard to resist. He observed: if you ask a question, people always want to know the answer. 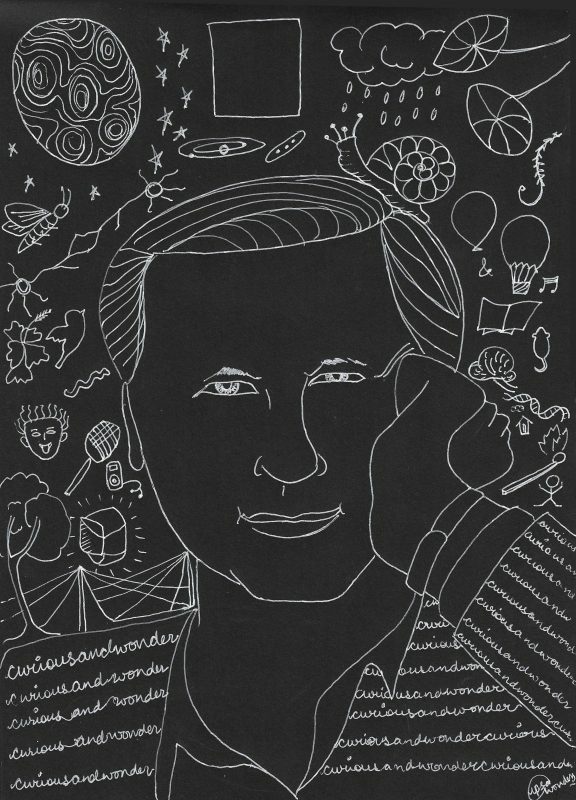 Illustration of Radiolab’s Robert Krulwich by Ipsa Jain. CSG Gurukool (the word originates from “Gurukula” in Sanskrit, which means a residential schooling system where the “shisya” or the students live with the “Guru” or mentor establishing a sacred “Guru-Shishya” or mentor-mentee relationship (Wikipedia). The group helps with resumes, cover letters, LinkedIn tailoring, and provides one-on-one advice/mentoring with PhDs who have successfully transitioned to STEM careers. This also includes suggestions on contracts, negotiation skills, interview skills, and post job mentoring. CSG data club is a community of like-minded PhDs interested in transitioning to data science. They discuss ways to initiate projects that will help them build their portfolio. CSG consultancy club is a community of PhDs across the world interested in life science consultancy. They solve case studies in groups and have started to participate in case competitions. CSG chat series is for PhDs in developing countries who are missing real-world knowledge of STEM careers. We conduct Skype sessions between industry representatives and PhDs in premier institutes in Southeast Asia (currently), so that when they come to the U.S.or Europe they already have an idea/awareness about STEM careers and what it takes. CSG coffee chats: Members conduct monthly networking meetings in the cities like New York City, Boston, San Diego, San Francisco, Bangalore, Munich etc., where the PhDs in these cities get to interact with industry representatives who have established STEM careers. STEMPeers: The founders are now organizing an annual meeting/conference called “STEMPeers” on September 23 in Boston. 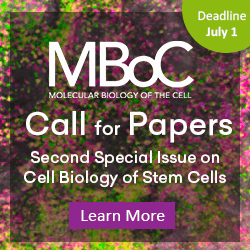 The conference is specifically for graduate students and postdocs in STEM who are interested in networking and career advancement. There will be talks from renowned professionals in the fields of research, scientific communications, and intellectual property. There will also be an open discussion panel to conclude the day’s event. More information about the conference can be found here. What is unique about all these initiatives is that these platforms are not designed to help STEM PhDs get “jobs” but rather to help them develop as “leaders” who can initiate and execute challenging programs. On another note, this platform is run entirely on a volunteer basis without any outside economic support. My journey at ClubSciWri has been amazing so far. I started off as an enthusiastic science writer with an aim to develop my writing skills and expand my network. Club SciWri and MedNess not only helped me establish my own lexicon but also refined and augmented my knowledge base. Additionally, the responsibility of delivering a biweekly blog evoked in me a deep sense of discipline and respect for writing. The experience I gained with my blog and the guidance I received from CSG Gurukool helped me in transitioning to a career as a Scientific Advisor. We are all blessed with multiple talents but CSG Gurukool helps you realize your intrinsic potential. The mentors not only helped me with job suggestions and resume tailoring but also with interview etiquette. The unconditional support I have received from the founders and the mentors is beyond comprehension. Many mentees return as mentors. The club is always looking for volunteers, so if you want to become part of this exceptional team, just get in touch with one of the members, including myself! Imit Kaur, PhD, is a Scientific Advisor at a large law firm and is a lead author and editor of MedNess. She has immense interest in delivering scientific communications. She also mentors the fresh talent pool interested in joining MedNess or Club SciWri.